Hi everyone, I hope you have enjoyed your extended winter break and had a good Christmas. It won’t be long now before the days start to get lighter earlier and we start to see evidence of spring. But please bear in mind it can still be pretty cold in the evenings so wrap up well when you come out and if the weather is icy or snowing I will have to cancel at very short notice. The best place to check for last minute notifications is on our Facebook page because I know you most of you all read postings there and anyone who doesn’t, I will text you. For anyone interested in joining our classes for the first time, please give us a call in the first instance and then I can advise where we are and confirm that we are holding classes on the evening. Now, before I go I just want to say a special “Thank You” on behalf of us all to Daneswood who support us through the management of our website. They have waivered the costs associated with Plugins for our website saving us over £30 a month. See you all on the 6th February. If you have missed dance class over the summer months you will not be disappointed to hear that we start back on Wednesday 12th September. Same place, same time dancers so so you there! I am posting a notice to say there is no dancing on the 4th and 11th April. Wishing you all a very Happy Easter! As it is extremely cold and we have a yellow weather warning for snow, class is cancelled. Please text me if you are a member to confirm you have read this. Hi everyone, just in case you haven’t seen this on our Facebook page, there is no dance class on February 14th due to it being half term week. See you all the week after next! If you have been missing your dancing then the wait is over as classes resume on Wednesday 10th January at the Kenn Centre. Thank you to everyone who took the trouble to vote for our Project. Voting closed on the 27th November and we have since learned that we are to be awarded £100 for the 690 votes we received. We are hoping that Devon will get behind us now that we have raised the public’s awareness of our campaign for votes in the news. Here is the article with videos and photos – voting is open for another 23 days so plenty of time to get behind us. I need help from all the lovely people out there to get behind a project that has the opportunity to benefit from the 2017 Aviva Community Fund. 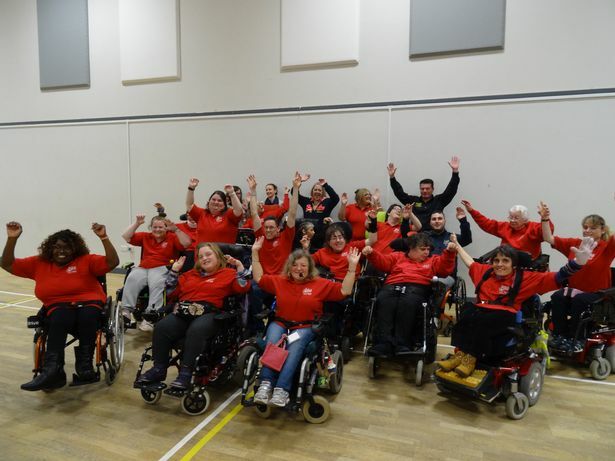 Isca Wheelchair Dancers in 2010 with the support of the National Lottery and we have 40 members from the disabled community that meet up once a week to enjoy dancing in their chairs and socialising. With your help we could benefit from funding up to £5,000 that would help our dancers attend dance classes by paying for their adapted wheelchair friendly taxis. Seriously, would you be able to fund £32 a week in costs just to get to a class you enjoyed? Please help support us by voting for our project. The project is live from the 24th October. Please help me to make this go viral!